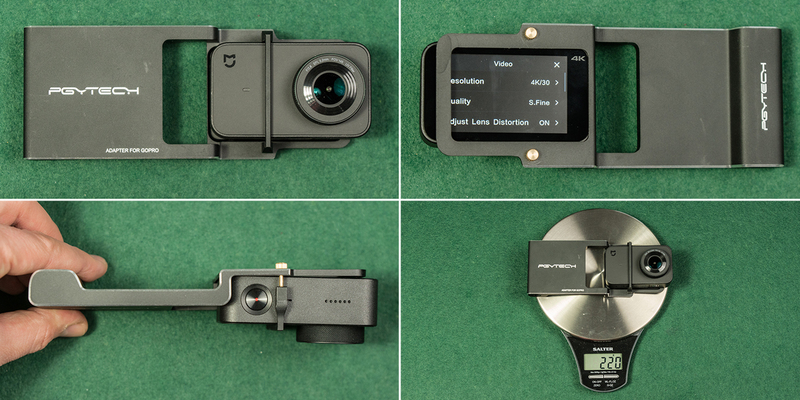 Xiaomi created a gimbal exclusively designed for Xiaomi Mijia 4K Action Camera. 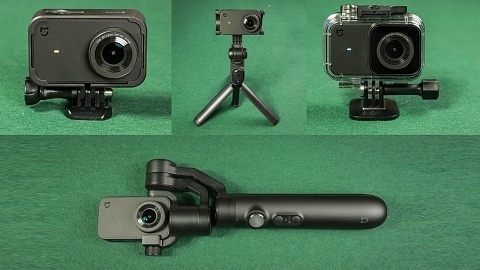 The camera is very well secured using the 1/4″ thread on the bottom of the camera and connected with the gimbal using the micro USB port. 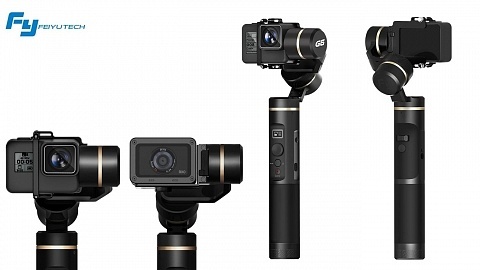 This way you can start/stop video recording, take a photo and change exposure using the buttons on the gimbal’s grip. Xiaomi Mijia camera can also be powered by the built-in 5000 mAh battery of the gimbal to extend recording time. When charging the gimbal with the camera mounted, both of them get charged. Xiaomi Mijia 3-way gimbal offers 360° rotation on the pan axis and -35° to +90° on the tilt axis. On the bottom of the grip there’s a 1/4″ thread to mount the gimbal on a tripod e.g.. Xiaomi gimbal weights 340g without camera. The modes can be selected with the trigger button (14). The gimbal powers up in Pan-Follow mode, which means the camera will follow the movement once you pan the gimbal. Double pressing the trigger button restores neutral position. When you press and hold the trigger button all axes are locked. You can now move the grip and the camera will always face the same direction. Via Mi Home App you can change the settings of Xiaomi Gimbal. To do so the camera has to be connected to the gimbal and to your smartphone via wifi. 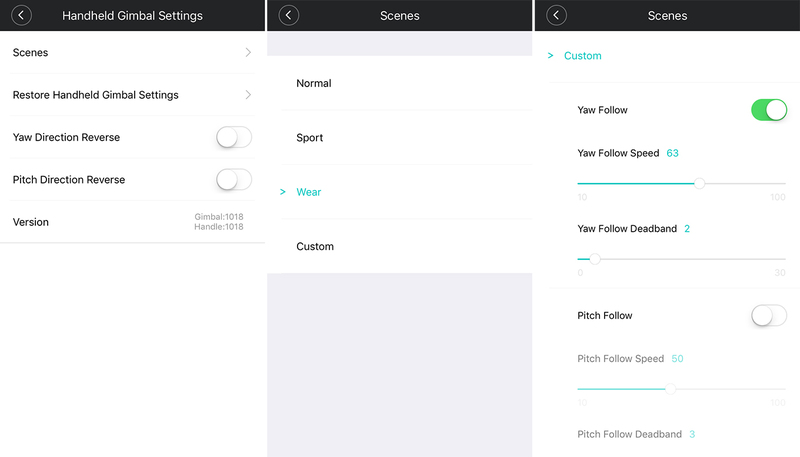 Within the “scene settings” you can adjust the follow speed and the headband of the gimbal. There are also predefined selections available. I saw a screenshot that you can adjust the motor’s strength, but I didn’t manage to find that setting. 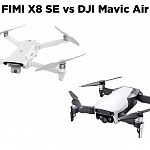 Feiyu SPG offers 3 great features, beside the fact that you can use it with a smartphone: It’s splashproof, the gimbal is made of metal and the batteries are exchangeable. On the downside you need two foam pieces to mount an action camera. 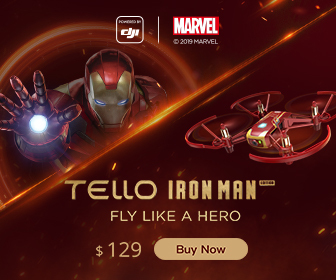 Not only Xiaomi Mijia but almost any brand. These foam pieces bear another negative aspect, the shutter button on top partially covered, so it’s hard to press. The touchscreen on the back is almost fully covered, there’s only a tiny hole in the center which you can use to frame your shot. It’s almost impossible to scroll the menu or change settings, you need to remove the camera. Important to note: the shutter button on the grip does not work with Xiaomi Mijia Action Camera, only with smartphones! Zhiyun Smooth Q looks and works pretty similar, there are a few differences compared to Feiyu SPG. Most noticeable the clamp is turnable and holds the camera sideways. This way you don’t need anything else to mount the camera. Secondly the shutter button on top is not covered and can be accessed easily. In contrast to Feiyu SPG, Zhiyun Smooth Q has a body made of plastic and the battery is built in. Same as SPG it’s splash-proof and works with smartphones as well. Note: The shutter button on the grip only work with smartphones, not with Xiaomi Mijia Action Camera! There is a second advantage of the clamp system holding the cam sideways. 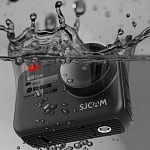 You can also use your camera within an underwater case. 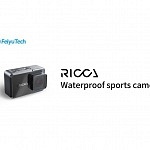 As mention Zhiyun Smooth Q is splash proof! As described above with Zhiyun Smooth Q the screen is not visible at all, with Feiyu SPG only a small part of it. A fix for that could be an adapter, but I experienced 2 problems with them: 1) There is currently no adapter for Xiaomi Mijia Action Camera available. The one shown below is for GoPro Hero5 black, therefore the screen is again a bit covered and the camera is mounted a bit crooked. 2) The weight of adapter & camera is 220g and that’s also the max. 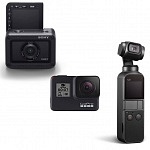 payload stated for Zhiyun Smooth Q. (For Feiyu SPG no payload is stated by the manufacturer.) So you are operating the gimbal’s motors with max payload which can cause them to break earlier. To me gimbals are my favourite action camera accessory as they stabilise your footage and therefore add quality to your videos. 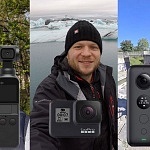 All three of them work well with Xiaomi Mijia Action Camera. 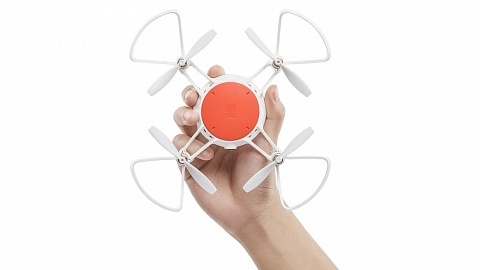 Xiaomi gimbal has the most convenient features: You can power the camera, control it via the buttons on the grip and the touchscreen is fully visible and clickable. 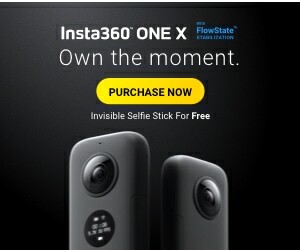 Therefore it’s the best and my first choice to use with Xiaomi Mijia Action Camera. If you want to be flexible there are other solutions that work well, however come with a few negative aspects.